Developing code locally on your computer has some major benefits over using a web server. For one, it’s usually faster as you don’t have to wait for your file changes to upload to the web. You’ll need to download & install WampServer before continuing with this tutorial. This tutorial assumes WAMP is installed under C:\wamp. You may change this path to reflect your own installation if it differs. Step 2: Make sure httpd-vhosts.conf file is included. Thanks to Dave Smith for pointing this out in the comments. 1) Enable the alias_module and vhost_alias_module for apache. Doing this will enable virtualhost aliasing in apache for your subdomains. So what’s going on with the code above? ErrorLog Path to your error log. This is optional. The directory permission definitions. Defined twice for both localhost.com and it’s virtual subdomains. 4) After making the changes to your httpd-vhosts.conf file, you must restart apache for the changes to take effect. Just click the WAMPSERVER icon in your Notification Area and choose “Restart All Services”. In order for you to access your localhost.com or example.localhost.com, you must first point these domains to your local IP address. Windows unfortunately does not allow you to use a wildcard in the hosts file. You will have to input each new subdomain into your hosts file for it to work in your browser. 2) Add a the following line to the bottom of your hosts file. Test! Check if your subdomains work. If you ever wanted to create a custom domain definition that pointed to a folder outside of your “subdomains” folder, you can do that! Just open your httpd-vhosts.conf file (See step 2.2), and paste the following directly after NameVirtualHost *:80 and before the first instance of <VirtualHost *:80>. This custom definition MUST be before your wildcard VirtualHost definition to work. Apache configurations can be a tad confusing sometimes. If you get stuck, let me know in the comments below and I’ll do my best to assist you. Please let me know the steps you took so I can better determine the issue with your setup. I’m having trouble in the Custom Domain. Thanks for your post. It was really helpful and I have created 2 subdomains in my local system. Please can you help how to configure subdomains for my server machine. I want to access subdomain from anywhere from the world. I have registered 2 sub domains for my site. The actual site domain refers to the WAMP server. But, Im not able to park the sub domains to my server. 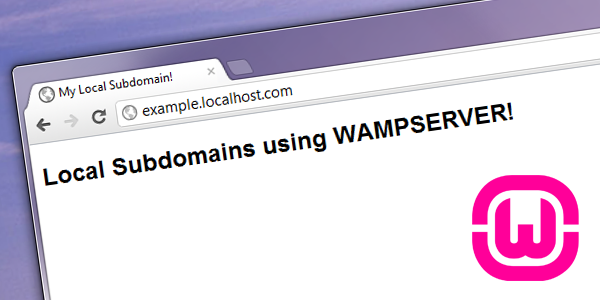 What you’re wanting is to access your local WAMP server via a domain through the internet. To do this, you need to make sure your ISP doesn’t block incoming port 80 connections AND you have a static IP address (which you would point your subdomains to. After this, you open port 80 on your router’s firewall, have it point to your computer’s IP address (the computer hosting WAMPServer). Then you just point your subdomain DNS records to your static IP address. 2) You need “directory” definition to let Apache know that it’s alright to view this folder. its not working for me ………………….. Thanks for the info. We are using port 8090 instead of 80. We have opened the port 8090 and the DNS is pointing to the static IP of my system. The firewall is removed for port 8090. I have 2 sub domains and mapped to 2 different folders in my server. But, when accessing both the sub domains, it redirects me to only one folder. i.e. domain 1 and domain 2 redirects me to the domain1 folder. Can you help me in this!! Also, if you are trying to load your domain locally via the internet (trying to visit mysite.com on the same PC wampserver is running), I’m not so sure if it will work. I do believe you still need to modify your Windows host file to point mysite.com to localhost. Otherwise you may experience an infinite loading loop. At first this didn’t work for me, but I remembered that the httpd-vhosts.conf is not always included by default; it is commented out in the httpd.conf. Thanks for pointing that out Dave. I didn’t experience this in my initial testing, but it seems other people are running into the same issue. Great that’s what it was for me! I followed your tutorial, however, I am still unable to view the subdomains. Instead, I am redirected to the main domain. Someone else pointed out that the httpd-vhosts.conf file is not always included by default in your httpd.conf file. After looking at your httpd.conf, that seems to be the case. On line 494 of your httpd.conf file, remove the hash (#) from the beginning of the line, save, then restart apache. This will include your httpd-vhosts.conf file into your main apache configuration file. I have included that line in now, and I am unable to view the site at all now. Oh… I intended for the subdomains folder to be outside of the www folder. pity it didn’t work out. I left the subdomains folder back into www folder and is working fine now. i fixed that problem ……. hey does anyone knows how to install a ssl certificate on apache on windows…….. I configured a virtualhost on WAMP Server like you have described before, but there are already existing sites in my localhost, when I add the virtual host It works fine but when I try to load existing sites they fail. The requested URL novirtualhostsite/index.php was not found on this server. Hmm, hard to say what it could be without seeing what your httpd-vhosts.conf looks like. If you post what you have in that file, I might be able to determine what’s causing your previous sites from loading. Well, the thing is that I need to configure one virtual host http://www.virtualhost1.com and preserve localhost for already existent sites in localhost than could be accessed through http://localhost/site1. Did you mean: http://localhost/site1/index.php? (note the forward-slash before “index.php”). Your VirtualHost configurations should not impair your default http://localhost/ access. Make sure you aren’t editing anything beyond what the tutorial outlines. If you are still having an issue, try completely clearning out your httpd-vhosts.conf file and restarting WAMP. See if you can access localhost from the browser. If you can, you must be using something your your vhosts file that is conflicting with the default localhost configuration. Try adding adding your vhost definitions one-by-one to determine which one it could be. Remember to always restart WAMP/Apache after making changes to the apache configurations. Make sure you completely restart Apache after making changes to the Apache configurations. I think that’s the most common reason why your configuration changes would not be working. in PHP it doesn’t return anything… do you know why not? Weird. Works for me. Are you echoing it out, and it still returns absolutely nothing? What version of PHP are you running and did you make changes to your configuration beyond this tutorial? Also try creating a brand new virtual host pointing to a folder without any files in it. Create one .php file with the $_SERVER['DOCUMENT_ROOT'] variable echo’d and see if it works. I would check your /wamp/logs/apache_error.log or /wamp/logs/php_error.log to see what errors are being produced. Make sure you are putting any variable value containing spaces within double quotes. It is a general rule of thumb that for web projects, you should not use spaces in folder names. I would recommend using underscores or dashes instead just to ensure the stability of your web application. You, Sir are a F*****G HERO! I spent all morning following loads of tutorials on this and nothing was working, until I found yours. Thank you. Bookmarked and Tweeting about it right now. Once again thanks for this, can I make a small recommendation? instead of “Allow from all” use “Allow from 127.0.0.1″ instead of allowing anyone to access it it restricts it to your machine. Did you follow the tutorial completely? If you follow each step, and make sure it’s done correctly there is no reason it shouldn’t work. Make sure you’re not skipping out on essential steps, like restarting the WAMP server after modifying your host files. If you’ve done everything, please be sure to describe what is happening when you try to access the subdomain. But, i would like to install WordPress MU on my local environment, i’m on windows 7 with wampserver 2. As stated in my article on Step #3, Windows unfortunately does not support wildcard rules in the hosts file. You will have to manually enter each subdomain you create in your hosts file to access it locally. I want $_SERVER['DOCUMENT_ROOT'] return my subdomain directory what should I do? It’s a know bug with mod_vhost_alias. People don’t recommend you use $_SERVER['DOCUMENT_ROOT'] for this exact reason, it can be unreliable in these situations. thanks axel for posting. i really like the idea of having my folders as subdomains so i can define my paths relative to the domain root. the only probems i encounter are in relation to rewrite rules. for instance: i´ve got a site that checks the request and if it matches a certain pattern then in redirects that request to my index.php where i have mvc magic going on. The requested URL /subdomains/example/index.php was not found on this server. is this also in relation to the $_SERVER['DOCUMENT_ROOT']; problem? All I know is that mod_vhost_alias doesn’t return the correct $_SERVER['DOCUMENT_ROOT'];. Thanks for this awesome article. Got it to work with no problems! What would be the correct configuration to achieve this result? See the Additionally section of the tutorial. It covers setting up static definitions that aren’t inherently part of your Virtual Alias settings. Just make sure that the configurations you make for this custom subdomain are ABOVE the VirtualHost configurations. I create a Sub-Domain manager to manage domains and subdomains on my local machine. So, i decide to make my own script to manage my Domains. And i create it, and than think about to share i with others to make others work easy. As its hard for newbies to edit files and make it ready to use domains and sub-domains on WAMP. If you find any bug or have any suggestion, Please Let know. im running a minecraft server on default port 25565 and i port foward too, and only i can access my server from the domain no one else please help. 2013-03-29 22:34:42 [INFO] Unknown command. Try /help for a list of commands. I’m not certain what you’re asking. Having “others” access your custom subdomain is a bit more involved and out of scope to what this tutorial covers (local subdomains). There are tutorials that will tell you how to allow people to access your local environment through port forwarding and proper DNS routing. Just Letting You Know, Hope this helps others. What you’re doing is mapping your own external IP to yourself, not actually making your site public. Other people won’t be able to type in http://www.yoursite.com and view it hosted from your computer. 127.0.0.1 and Your external IP address are essentially the same thing for you, and you alone. They both point to the your local environment. Using 127.0.0.1 or your external IP will usually produce the exact same results. I know this is a little old of a post. But, I’d update the part of editing your host file to run notepad as administrator. That worked flawlessly, and took only 20 minutes. Hey, just a kick word to thank you, didn’t knew about the vhost_alias module. You could use domains like 42foo.com or vcap.me to improve you configuration, no need to modify host file (But it doesn’t work if your internet is down). ‘Parent: Received shutdown signal — Shutting down the server. Child 4676: Exit event signaled. Child process is ending. Child 4676: All worker threads have exited. ‘Warning: DocumentRoot [C:/wamp/www/subdomains/%1] does not exist’. I’d love to hear your thoughts – your subdomains folder implementation looks a lot cleaner and I’d prefer to use this method is I can get it to work! Well, I’m not sure what I did, but the Apache service in wamp won’t start now. I forgot the to check the vhost_alias_module and when I went back to enable it I received the following message: Could not execute menu item (internal error) [Exception] Could not perform service action: The service has not been started. Any idea what to look at to get Apache started? Work backgrounds from the changes you made and undo things one by one and test. From my experience, it could be you’re referencing an incorrect folder path in one of the alias configurations. I was working in local environment with multiple sites in my dreamweaver and i have used all variant of setting mentioned above but in as my site is localhost/mytend/web it works fine us for years. but as we trying to map images from subdomain as images.localhost/myintend/web it does not work as soon as we type the mention domain it redirect to http://www.images.localhost on internet. I want to know that how will I be able to do the above steps in a Webhost like Hostgator. If the above steps are not possible in Webhost, then what should I do. Actually I want to make a website that builds free website like Blogspot. I will need provide subdomains to the users like example.blogspot.com. Please help. Does this work with developing word press multi-site network locally? For some reason, I can’t get wordpress to allow me to use subdomains, only sub-directories. You tutorial is great but I’m getting a 403 Forbidden when I try to access either localhost.com or any of the subdomains. Any ideas on what is misconfigured?